See Gary's latest promotional flyer - Click this link! Gary's schedule of shows for 2018 is as full as ever. The latter half of the year is particularly hectic with shows running simultaneously in New York City; Morro Bay, California; Bozeman, Montana; Fish Creek, Wisconsin and Loveland, Colorado. Most significant is a duo show at A. Banks Gallery in Bozeman where Gary has been represented for a number of years. He will have a wall of the gallery with around 13 mostly new paintings. He shares show billing with exceptional wildlife and western artist Jennifer Johnson. Through the month of September Gary has a small painting of the Taos, New Mexico high desert in one of the longest running pastel exhibitions. His traditional landscape work is always a bit of an anomaly in the high fashion exhibition spaces of New York City yet he has been chosen from among thousands of entries nearly every year for the honor of hanging in the National Arts Club Grand Gallery. It's called 46th Annual Enduring Brilliance, sponsored by Pastel Society of America. A larger work, Where Angels Soar, will be shown in the American Impressionist Society's 19th Annual Show in Fish Creek, Wisconsin. The venue is a little off the beaten art path but it's a top notch show that might be worthy of a visit if you're within a few hundred miles and want to see the best modern American impressionism. On the far west coast in lovely Morro Bay, California the Pastel Society of California holds its annual international exhibition in September. It's one of the very top pastel shows of the year. Although the organization sounds like it's strictly west coast, it has a large membership from all over the US because of its high prestige. 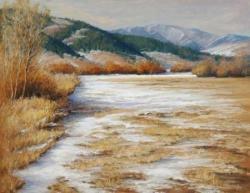 Finally, in Loveland, Colorado Pastel Society of Colorado hosts an annual members only show. this year it is entitled, This Place The place can be anything significant to the artist. Gary chose two pieces from very different but important places to him. Swan Song depicts Trumpeter Swans winging up stream along the Firehole River in Yellowstone National Park. Yellowstone is Gary's favorite park and place to paint. Moonset in Red Rock Country is in Arches National Park where Gary and his wife vacationed a few years ago and brought back memories of the park when Gary was there with his folks many years ago. It's a special place with many special memories. In addition to online and club exhibitions, Gary joined the Rocky Mountain Plein Air Painters in Jackson Hole, Wyoming, for the 2018 Plein Air for the Parks two week paintout. The annual event culminates in a series of public painting demonstrations and an art show at the Craig Thomas Visitor and Discovery Center in Grand Teton National Park. The reception for the show was very well attended and Gary sold three of his five paintings there. The two remaining pieces traveled a few miles south to Big Piney for the annual Lynn Thomas Memorial Art Show. They both found homes at that show and never came back to Buffalo. From Jackson Gary drove an eight hour marathon to the Cheyenne Frontier Days Art Show & Sale where a reception was held in the afternoon hosted by Governor and First Lady, Matt and Carol Mead. This long-running art show benefits the Cheyenne Frontier Days Old West Museum and runs in conjunction with "Daddy of them all," The Cheyenne Frontier Days Rodeo. Gary had five pastel paintings in the show in a variety of subjects and sizes. The show advertises itself as featuring the nation's top artists presenting original art that celebrates the heritage of the American West. Gary was once again in room 177 of the Best Western Plus Heritage Inn, exhibiting all new work during Western Art Week in Great Falls, Montana. This year the event ran from Wednesday evening, March 14, through Saturday March 17. His 20" square quick-finish painting of wildflowers on a fire-scarred mountain slope was snatched up by a couple who has collected Gary's work in the past. Gary will be back at the show again next year so plan to visit him in Great Falls next March. One of the club shows Gary is in this year for the second time is the American Impressionist Society's Small Works Showcase. His New Mexico piece, High Desert Glare was exhibited at Greenwich House Gallery in Cincinnati, Ohio in March and April. It is an impression from the High Road to Taos where the thin high desert light has a distinct feeling to it that calls one back again and again. Also on the calendar for March and April, Gary had a painting in Horizons, Online Exhibition, a members-only exhibition sponsored by Pastel Society of Colorado. His painting, Moonset in Red Rock Country records Gary's actual memories of watching the moon set from Arches National Park with fabulous rock formations protruding up into the dawn sky. Gary has once again had a busy year of exhibitions, adding a few new ones to his usual roster. Gary's first year at The Cheyenne Frontier Days Art Show & Sale in July and August went very well. This long-running art show benefits the Cheyenne Frontier Days Old West Museum and runs in conjunction with "Daddy of them all," The Cheyenne Frontier Days Rodeo. Gary had five pastel paintings in the show in a variety of subjects and sizes. The show advertises itself as featuring the nation's top artists presenting original art that celebrates the heritage of the American West. Gary exhibited during Western Art Week in Great Falls, Montana, in March. Once again his quick finish painting sold very well at auction. Gary experimented with sharing his room this year with another artist but will return to soloing in 2018. In 2018 he'll again be in room 177 on the west side of the Best Western Plus Heritage Inn so make plans now to visit him there. Gary participated in the 4th Annual Brinton Museum Small Works Show in September and October. The museum, in Big Horn, Wyoming, is open to the public from 9:30 to 5:00 daily. He had two pieces for sale in the exhibit of 152 well-known artists hailing from all across the country. Gary had two paintings in Pastels USA, the annual international exhibition of pastel art sponsored by Pastel Society of the West Coast. Gary is a signature member of the group and has been juried into this show nearly every year. 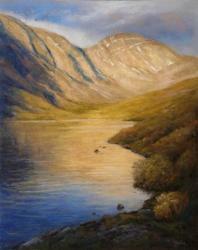 He also exhibited in the Northwest Pastel Society's annual Signature Member Show in November. This year the show was held at the Attic Gallery in Camas, Washington. In the show, Golden State Sunshine, sponsored by the California Art Club in Altadena, CA, where Gary had, Shortening Shadows, Garrapata, his sunny discourse on the Carmel coast which has made the rounds of many national shows. 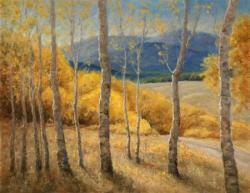 Also he was in the 12th Annual Mile High International Exhibition of pastel work in Denver, Colorado. Gary had a small painting in the show which continued his streak of good fortune in acceptance to the show back as far as 2008. 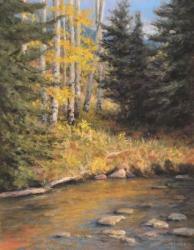 Gary has served as a director of the Pastel Society of Colorado, sponsor of the exhibition, since 2010. July started off with a bang! 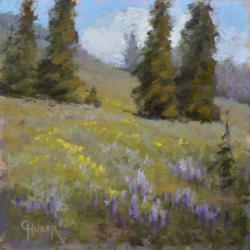 Gary was again a guest artist at Plein Air for the Park, a two-week paintout and art show to benefit the Grand Teton Association in Grand Teton National Park. In this, the fifth year of the annual event, Gary garnered an Honorable Mention award for his early morning depiction of Colter Bay Marina and distant Paintbrush Canyon steeped in pink morning glow. His work was well-received at the exhibition which helped secure him a permanent full membership in Rocky Mountain Plein Air Painters. Chances are Gary will be back in the Teton area painting again next year hoping to do even better. In June Gary was again an invited guest in Illume Gallery's exciting Where in the World is Plein Air outdoor painting and video-producing event. Gary's work and videos describing the process can be seen on the Where in the World web site. In April and May, Gary held two workshops, the first at Art 321 in Casper and the second at the Wyoming Artists' Association Convention in Dubois, Wyoming. Both events were sell-out crowds. In fact in Dubois it was standing-room-only. Gary has vowed to teach again soon; possibly a plein air workshop in his home town in 2017. Gary exhibited during Western Art Week in Great Falls, Montana, from March 16 through the 19th. He had a lot of very new work that was enjoyed by a somewhat smaller crowd than the previous year but his quick finish painting sold well at auction. In 2017 he'll again be in room 177 on the west side of the Best Western Plus Heritage Inn so make plans now to visit him there. Gary's first event of the year was in honor of the National Park Service's 100th anniversary. A show entitled, Close to Home: Our Own Spectacular National Parks, was staged at St. George Art Museum in St. George, Utah. Gary's entry sold to a St. George resident on opening night. It was a piece inspired by watching rock formations emerge out of a sea of blue-violet shadow as the sun rises over the Grand Canyon. Out of the Canyon Rising was the painting's descriptive title. It's been a whirlwind of a year! Breaking news: Gary received the Southeast Pastel Society Award in the 43rd Enduring Brilliance Exhibition of the Pastel Society of America. It's his second award in the long-running show, held every year in the historic National Arts Club in New York City. The show runs until September 27. 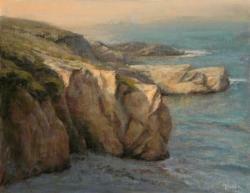 The winning painting, Shortening Shadows, Garrapata, can be see below right and demonstrates Gary's effective rendering of coastal California's atmospheric ambiance. Gary was in Jackson Hole, Wyoming for the 2015 Plein Air for the Park event, sponsored by Rocky Mountain Plein Air Painters in conjunction with Grand Teton Association painting the greater Teton area for ten days along with some of the best western landscape painters working today. The show was hung for five days and resulted in 86 sold works, four of which were Gary's. Mule Ears, Lupine & Sage (left) was one of the first pieces sold in the show. 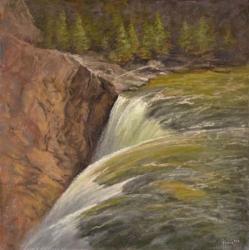 Early in the year Gary participated in the Out West Art Show in Great Falls, Montana. The show began with an opening night celebration on March 18 and ran through the evening of Saturday, March 21. Many of his new paintings filled the walls in room 177 (same room as last year) of the Western Heritage Hotel. On Saturday he took part in a "quick finish" event in the central plaza of the hotel followed by a very successful auction of the works produced. Gary plans to participate again in March 2016 where he will again feature new work. 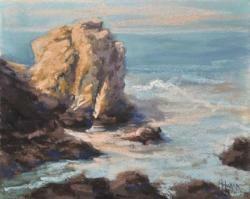 In early April he attended the Plein Air Convention in Monterey, California with several hundred other artists. Gary received a complimentary pass to the convention thanks to Plein Air Magazine and awards judge, Clark Mitchell, who awarded it last year in the Pastels USA competition (see 2014 Events below). Gary was juror and judge of National Greeley Art Exhibition in early May and held a short half-day workshop in Greeley, Colorado. In early June Gary was in Albuquerque, New Mexico, for the biennial convention of the International Association of Pastel Societies where he had the painting, Zion's Embrace (left), in the 3rd Master Circle Exhibition. He was thrilled to arrive and discover the painting had garnered the prestigious Albert Handell Award. No sooner was he home from the IAPS convention when Where in the World is Plein Air 2015 debuted. That was three days of fun and painting adventure! Each day a select group of artists painted a painting wherever they happened to be in the world that day. Each artist then uploaded short videos they made, "selfies," describing what they were seeing and thinking and feeling before, during and after making their plein air paintings. Painted works are available during and after the event online at the link above where you can also see the live videos. The work was hung at the Illume Gallery of fine Art in Salt lake City. The painting, Over the Banks (left), was the third piece gary completed for this show. Gary will have a solo exhibition and painting demonstration at The Brinton Museum in November and be a part of the annual small works show in September in their brand new exhibition gallery. 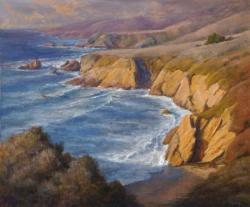 Ebbing Tide, Point Lobos (below right), was in the pastels USA show at the Haggin Museum, Stockton California, and Out of the Canyon Rising (right) was in a show sponsored by California Art Club, the Spirit of Adventure. 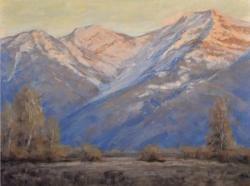 Canyon Gold, Teton Range (right) was awarded Honorable Mention in the Mile High Pastel Exhibition in Denver, Colorado. Two paintings were exhibited at the Dana Gallery in Missoula, Montana as part of their annual Icons of the West show. they are also shown on the right - At the Brink, Lower Yellowstone Falls and Canyon Mist. Gary has two new galleries representing his work this year - A. Banks Gallery in Bozeman, Montana and Spirits in the Wind Gallery in Golden, Colorado. Both have a nice selection of his work in all sizes. There are a lot of events to report here for 2014. Most recently Gary won the Plein Air Magazine Award in the international pastel show, Pastels USA, in Morro Bay, California. 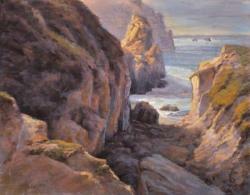 The award was given for a scene of the California coast, Shortening Shadows, Garrapata. The award sponsors him to attend the Plein Air Convention in Monterey next April. 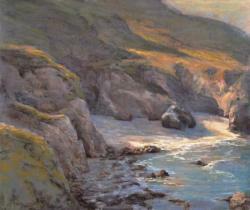 His painting, Ebbing Tide, Point Lobos is currently at the Butler Institute of American Art in Youngstown, Ohio for an extended exhibition, having won the Pastel Society of North Carolina Award in the 42nd Enduring Exhibition at the National Arts Club in New York City's upscale Gramercy Park district. 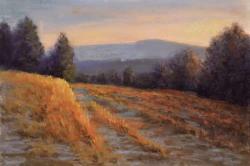 Earlier, Gary had two pieces accepted in the Pastel Society of the West Coast's members' show. Ebbing Tide, Point Lobos took the First Place ribbon from judge, Kim Lordier. Kim is an expert painter of the California coast herself and has a fine appreciation for the history of West Coast impressionism. That makes this award especially appreciated. Thanks Kim and PSWC! Incidentally the award earns Gary the final point needed for signature membership in what may be the largest regional pastel organization. Gary is participating in an invitational show with Lorenzo Chavez, Aaron Schuerr, Bruce Park, Bob Barlow and Mike Barlow in September at the Waterworks Art Museum in Miles City, Montana. Gary was the only of the artists to make the four hour trek to Miles City for the opening but enjoyed meeting the people who staged the show and found the town and its people delightful. The show is hung with a very high degree of professionalism. Gary has been invited back to the second Brinton Museum 6x6 show this fall. The stable of artists has been culled from 129 down to 100 and Gary is happy to have made the cut. He sold well at last year's show and perhaps that had something to do with it. Gary enjoyed the opening reception in spite of a very early flight to California the next day for the Mendocino Open Paint Out. He made several great contacts with other artists that are discussing possibilities of showing work together in the future. A distinctive honor, Gary was a "Celebrity Artist" at Mendocino Open Paint Out in early September. He gave a two hour demonstration of his pastel methods to a full room of eager attendees and completed five paintings in the field while there. Gary offered a three day workshop in Dubois, Wyoming on July 18-20 in conjunction with the Wind River Valley Artists' Guild's 65th Annual National Art Show. Gary was the judge of that exhibition. Dubois is in a beautiful setting and close to Grand Teton and Yellowstone National Parks. Read how the class turned out and the fantastic comments he received on the Workshop page and more about other learning opportunities. Thanks to all those who came to see Gary's room at the Western Masters show in Great Falls, Montana, at the Western Heritage Inn where Gary had over 40 works on exhibition. Many paintings were brand new and exhibited there for the very first time! He's proud of the direction his work is going and would love for you to see it and be part of the Western Masters excitement next year! You can read more on his blog post. Next year he will be in the same room, 177, but the show will be under a new name: Out West Art Show, and will work more closely with the C. M. Russell Museum in order to attract more of a crowd to the Western Heritage venue. This is shaping up to be the biggest year yet for Gary and he'd love for you to be a part of it either through attending one of the shows or even better, participating in a workshop with him. Teaching is something he has always felt was an important way to pay forward all the help he has been given by his teachers and mentors. The response from his classes so far: "Absolutely overwhelming!" He can't wait for the next opportunity to share his love of pastel landscape painting with more eager students. Gary taught a two-day workshops in his home town of Buffalo, Wyoming the November 16-17, 2013. It was be held in the Cowboy Carousel building, newly remodeled for classes. The workshop was sold out and participants had a great experience judging by their written evaluations. The Wind River Valley Artists Guild will present a three day workshop with Gary Huber in July, 2014 in conjunction with their 65th Annual National Art Show. Gary will be the judge of awards in that show too. A number of very nice awards came Gary’s way this summer: Best of Show in Pastels in Light for the small painting, Rocky Fortress, First Place in Tight Focus 2013, for another small piece, Fenceline, The Landscape Award in the 64th Annual National Art Show of the Wind River Valley Artists Guild for Stepping Stones and a Judson’s Art Outfitters Award in the Signature and Master Signature Member Show of The Pastel Society of Colorado for Rendezvous Peak Sunrise. You can read about some of the awards on Gary's Blog. Besides these, Gary has been in so many art shows this summer that just a summary of them is enough to give an idea of how busy he has been: IAPS Second Master Circle Exhibition in Albuquerque, New Mexico, Pastels USA in Ross, California, Wyoming Governor’s Capitol Exhibition in Cheyenne, Wyoming, For Pastels Only on Cape Cod 2013 in South Yarmouth, Massachusetts and the 27th Annual International Open Exhibit of Northwest Pastel Society in Tacoma, Washington. Gary exhibited Edge of Walters' Farm in the Master Circle Exhibition. The painting has special meaning to Gary which you can read about on his blog. 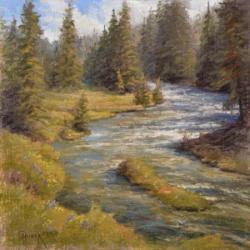 Upcoming shows include Colors of Fall, from September 13-15 in Great Falls, Montana, About 6 x 6 at The Brinton Museum in Big Horn, Wyoming, 9th Annual Mile High International Pastel Exhibition in Grand Junction, Colorado and Northwest Pastel Society’s 2013 Signature Member Show in Anacortes, Washington. Gary will have about 30 paintings for sale at Colors of Fall. The exhibition is open on Saturday the 14th and Sunday the 15th of September from 10 a.m until 5:00 p.m. Two of the feature paintings are the very recent paintings, Circle Park Celebration, one of the largest pieces Gary has done recently, and the award-winning Rendezvous Peak Sunrise. In addition, Gary is participating in the WaterWorks Art Museum’s 38th Annual Invitational Art Auction Exhibit in Miles City, Montana. The auction is to be held Saturday, September 28. Two honors came on the same day in April. Gary found out he had been juried in as a signature member of the Pastel Society of America. This is a signal honor and proves what many have long known, Gary is achieving higher and higher levels of recognition for his pastel work. You can read about the process of applying for the honor on his blog, PSA Signature. The second honor that day was to also discover that he had been granted signature membership in the Northwest Pastel Society. In that organization it requires three acceptances in their international annual show. 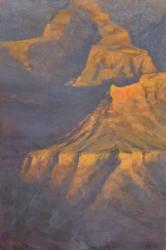 Gary had two paintings accepted: Bighorn Sunrise and A Pointy Rock at Rocky Point. 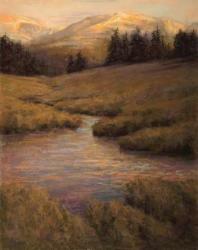 Read more about it in the blog post Northwest Pastel Society's 27th Annual. No sooner did Gary discover he had won Master Circle status in IAPS (see next note below) than he was informed he had won an Honorable Mention in the 2013 Pastel 100 competition sponsored by Pastel Journal. The magazine for pastelists claims a circulation of over 30,000. There were over 1250 landscape entries from which 20 awards were chosen. 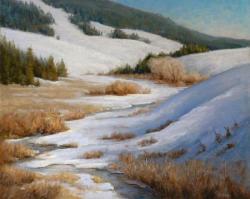 A photo of his winning entry, Early Snow, Lake Creek, appeared in the March-April issue of the Journal. Southwest Art, Pastel Journal's sister publication, had a short feature on Gary's work in the May issue. See the blog post Pastel 100 Award. The biggest honor of 2012 came at the end of the year. Gary will be inducted into the International Association of Pastel Societies Master Circle, having accrued enough points for that honor in the last IAPS show. He will be awarded the Master Circle Medalion at the 2013 convention in June in Albuquerque. Read about it on his blog. Once again Gary has the distinction of having a painting in the International Association of Pastel Societies' annual Web Show. The painting is Bighorn Sunrise shown at the right. It's a beautiful exhibition which can be viewed online here. Gary is honored to have three paintings in the Randy Higbee Gallery's 6 inch Squared show beginning December 8, in Costa Mesa, California. The paintings can also be viewed on Gary's Facebook page in the Small Works Photo Album. The pieces were done especially for this show and are of California coastal subjects. 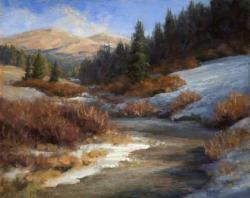 The Pastel Society of Colorado awarded Gary Master Signature Member status in November. This is the society's highest ranking awarded in recognition of the success Gary has had in national art shows and his ongoing service to the society. He will be offering a demonstration to the group on February 9, 2013 in Denver. See two of Gary's small works in the show Tight Focus, a show of 6 x 6 inch paintings in Idaho Falls in the Blake G. Hall Gallery from November 10 through January 5, 2013. 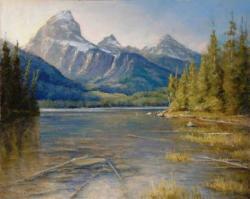 More info is available on the Pastel Society of the Northern Rockies web site. Gary participated in the new show, Colors of Fall, sponsored by the Great Falls Ad Club who used to sponsor the famous Charlie Russell show. This is a new venue and we all hope it turns out as successful as the Russell show. Great Falls has proven itself to be a great host city for art events. You can read Gary's blog entry to learn more. Another honor came this year to the painting, Into the Aspen Grove, which won the purchase award in the 63rd annual Wind River Valley Artists' Guild national show. It was a surprise to Gary to win that award but the board of directors "Just couldn't resist it," according to one of the board members who made the selection from several hundred entries. 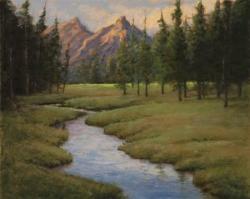 The Pastel Society of the West Coast holds a juried members show every other year. This year Gary had two paintings juried into the show and received an award for a California seascape, Garrapata by Morning (at right), which was painted from a field study done on location above the October surf. My Parents' Woods was also in the show. This year the IAPS show was in Brea, California, and two of Gary's paintings were juried into the show. It's always an honor to get into those top tier pastel shows but to have two paintings accepted is a real thrill. Early Snow, Lake Creek, on the right was one of them and the other was Table for Four with View. The Mile High National Exhibition of the Colorado Pastel Society exhibited two of Gary's paintings this year again: Peaceful Meanders (at right) along with A Dramatic Flair. The juror was Elizabeth Mowry whose contemplative scenes have been among Gary's inspirations. 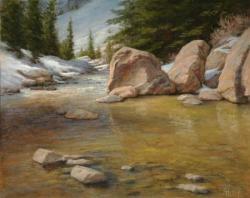 Gary gave a painting demonstration for the Pastel Society of Colorado in May at the Art Center in Grand Junction. The demo was well received and the painting he did was sold by auction to help the society fund their charitable work with cancer survivors. Thanks to Penny Creasy for pulling all that together in a short time. His painting Winter Glade won second place in the society's annual members' show. First Place! Two of Gary's paintings were juried into the show, Richeson 75 Pastels, sponsored by Jack Richeson & Co. The show can only be seen online. Look half way down the online page to find my entries. March Fields shown at the right, received First Place! Also in the show is May Snow and Megaliths. My Parents' Woods was given meritorious recognition and will also appear in the show catalog although it is not in the online exhibition. The jewel-like painting Quiet Meanders won Best Miniature this year at the Western Spirit Art Show in Cheyenne, Wyoming. A larger piece titled Best Out West was in the Railway Art Show from at the Cheyenne Depot Museum. The painting features a pair of modern locomotives hauling coal past an ancient grain elevator along the tracks north of Gary's home town. Gary says he is interested in how railroads have reinvented themselves to stay viable while some western lifestyles have passed from the scene. Stone and Ivy was displayed at The View Arts Center in Old Forge, New York through June. Northwest Pastel Society displayed Into the Aspen Grove and Sheltered Cove in their 26th Annual show in Tacoma, Washington. Sheltered Cove received a Juror's Award. 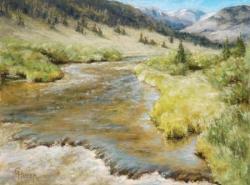 Two paintings were accepted into the Wyoming Governor's Capitol Art Show in Cheyenne. They are Stepping Stones and Rock Solid. The International Association of Pastel Societies hosts an online exhibition each year in the fall. 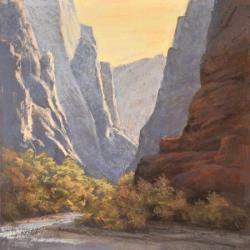 Gary's piece, Avalanche Canyon was in the show for 2011, making it his third acceptance into that organizations' great shows. Gary gave a pastel painting demonstration in the Bradford Brinton Memorial & Museum on July 30 and 31, 2011. Attendance was light but those who came said it was a great experience. One artist who was there said it was the best day she'd had in years. We had a good conversation about art and life while Gary painted. The painting that resulted was a winner and sold as soon as it got to a gallery. Gary's solo show, Of Mountains and Meadows, at the Bradford Brinton Memorial and Museum ran for over a month and sales were brisk. 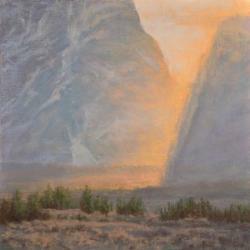 He was represented in Pastels U.S.A., sponsored by the Pastel Society of the West Coast again in 2011. The show was at the Haggin Museum in Stockton, CA. His entry was March Fields. March Fields was displayed at the National Arts Club in New York City for the better part of September as part of the Pastel Society of America's national show, Pastels Only. Gary received Honorable Mention for the painting, Stone and Ivy, in Pastels in Light, 2011, in Folsom, California, sponsored by the Pastel Society of the West Coast. Awarded First Place, Professional Pastel in the 46th Annual Art Show sponsored by Cody Country Art League for Into the Aspen Grove, this was the second year in a row that Gary has won major awards in this prestigious event. He also received Honorable Mention for Banks of the Firehole. Side Channel was awarded the Pinnacle Bank Award. Gary was juried into the International Association of Pastel Societies annual show, held in Albuquerque in conjunction with IAPS' biennial convention. His entry, May Snow and Megaliths (above left), is a scene inspired by a remote canyon just west of Buffalo, Gary's home town. This was the last snow of the season and the temperature of the air is a lot warmer than the chilly water at his feet. The show hung at the Hispanic Arts Center from June 1st to 5th and was very well attended. Western Spirit Art Show wrapped up in Cheyenne on April 17th. Gary had one painting in it this year - Geyser Pool along with a miniature piece. Gary participated last fall in the 6th Biennial Invitational Exhibition of the Bradford Brinton with his piece, Rock Solid. Pastel Society of Colorado held it's 2010 Mile High National show in Grand Junction Colorado. Gary had a painting in the show and was featured in the show's literature. Sally Strand was the juror, known for her consummate skill in portraying the color of light. Gary's entry was May Snow and Megaliths. Pastel Society of the West Coast juried two of Gary's paintings into their members-only show in 2010 including Winter's Getting Old (right) and Edge of the Wild. It ran from August 12 to October 2 at The Arts Building Gallery in Auburn, California. Wind River Valley Artists' Guild, 61st National Fine Art and Photography Show at the Headwaters Arts Center in Dubois, Wyoming. July 17-July 26, 2010. This great show was good to Gary again last year. 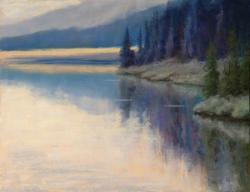 He won first place in the professional pastel category for the third time with Taggart Lake Shallows (right). 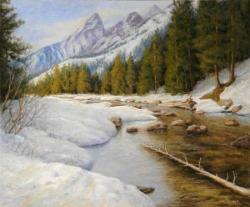 Two of Gary's paintings were juried into the show, Pastels U.S.A., sponsored by the Pastel Society of the West Coast. This is one of the country's most prestigious pastel shows. This year it is held at the Art Museum of Los Gatos in Los Gatos, California. Sheltered Cove shown at the left, took the Pastel Journal Award at the show! Also in the show is Avalanche Canyon. 16th Juried Exhibition of the International Association of Pastel Societies will be held this year at the Butler Institute of American Art in Youngstown, Ohio. 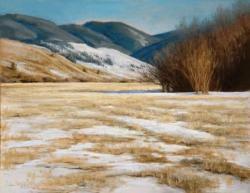 Gary is thrilled to have his painting, March Fields, accepted into the show by a panel of three distinguished jurists. As one of only 36 paintings hung, it is a very special honor to be seen among some of the finest pastellists in the world. July 11 to August 29. Reception July 11, 2-4 p.m. in the Flora B. Giffuni Gallery. Two of Gary's paintings were juried into the show, 2010 Juried PSNR Exhibition, sponsored by the Pastel Society of the Northern Rockies and held at Brown's Gallery in Boise, Idaho. The gallery is in a new location so call before you go. (888) 342-6661. Also in the show is Sunset among Willows. See three of Gary's quieter scenes in Exploration of a Medium: Pastel Art at the Center for the Arts Evergreen between July 2nd and 30th. Afternoon Atmosphere, Rainy Season and Early Risers (at right) are the ones in the exhibit. See four of Gary's paintings in the Cody Country Art League's National Show which runs from June 11 to July 11. Three of the paintings received awards, two of them among the top awards of the show. The Snow Fence won the Buffalo Bill Historical Center Award. Evening on Doyle Creek won the H&R Block Award. Over 200 paintings are in the show. For more information about the show call (307) 587-3597 or e-mail codyart@wavecom.net. 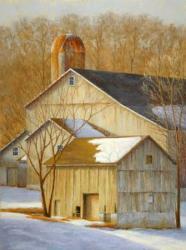 6th Annual Northeast National Pastel Exhibition at the Arts Center in Old Forge, New York. June 12-July 10. Opening reception and preview June 11, 5:00-7:00 pm. This is the third year Gary's work has been juried into this fine show and the first time that two pieces were accepted. The second painting is Winter Sunset. Best of Show! That's what judge Duane Wakeham said about Gary's painting Winter Morning Barns. 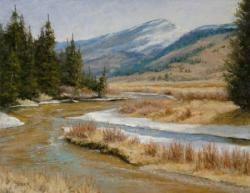 He received this auspicious award in the Mile High National Exhibition and Sale sponsored by Pastel Society of Colorado. This year the show is at the very elegant Sangre de Cristo Arts Center in Pueblo, Colorado, August 17 - October 24, 2008. Gary went to Pueblo for the awards ceremony. He said that Pueblo appears to be transforming itself from a soot-blackened steel mill town to an open, clean, welcoming hub of artistic activity. The Arts Center complex is one of the nicest he's seen. The show itself was hung beautifully with many stunning pieces of pastel art. It was a busy summer. Gary has been to Dubois and Cody for shows, taking second place in the Professional Pastel divisions of both shows. In Dubois the award is for a new piece entitled A Bend in the Wind, shown on the right, which also garnered the Popular Award. Gary won the Popular Award last year as well. In Cody it was for Long Lake, a lake in the Beartooth Mountain Range. Gary has been to the Tetons twice this summer gathering new material. The latest trip was with flowers bedecking the meadows and some of last year's abundant snow still festooning the rugged peaks. He has created a new body of work from the trip. The earlier trip in May resulted in the paintings recently displayed in Dubois and also at his feature show in Cody at the Cody Country Art League from July 31 through August 15. Almost overlooked in the flurry of activity for July was recognition by the Paint the Parks organization for two of Gary's paintings. Ascent to Angels Landing received Top 200 designation and Rock Garden on the Rim was selected for the Top Mini 100. And one more July honor was Gary's election to full Signature Membership status in the Pastel Society of Colorado. Signature status is granted to members who have shown superior capability in the pastel medium through acceptance and awards in national juried shows. The letters PSC after the artist's name are indicative of this status. Gary was the featured artist at Deerfield Gallery in his home town of Buffalo, Wyoming throughout June. He had recent work from the Bighorns on exhibit. The opening reception was well attended by the well-heeled of Buffalo. Two paintings sold at the opening and two more later. 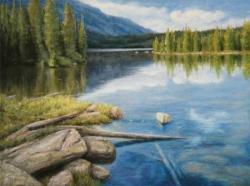 In June Gary's painting Long Lake won 2nd in Professional Pastel at the Cody Country Art League's prestigious annual members' show. 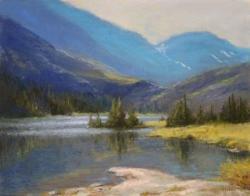 In Loveland, Colorado Gary was one of the featured artists in the Pastel Extravaganza show sponsored by the Pastel Society of the Northern Rockies. The Western Spirit Art Show & Sale at the Cheyenne Frontier Days Old West Museum was a great success. Gary had three paintings on exhibit. His miniature piece, The Eddy, was sold on opening night within minutes of the show's opening. The big thrill for Gary was winning the Best of Show in Pastel for his piece Torrey Creek Bluff. The judges said they awarded the prize to that painting but in fact all three of Gary's works showed the same strength and it was a difficult task to choose between them. Also on exhibit were June Snowbank and Long Lake. Gary is a featured artist in the fall 2007 issue of Peaks and Plains magazine, the in-flight magazine of Great Lakes Airlines. The five page article briefly recaps the artist's influences and philosophy but is mostly about the paintings: Six recent works are shown in large format and glorious color. Great Lakes' main hub is in Denver, Colorado and has flights to many exotic destinations including Sheridan, Wyoming. Hopefully the article will bring some new people into Foothills Gallery. Click here for a look at the article and please be patient, it may take bit of time to download. Last year's Wind River Valley Artists' Guild show, the 58th annual, was a big success for Gary. It was his first time to enter the show and he walked away with the first place award in the professional pastel division as well as a "popular award" in the same division. 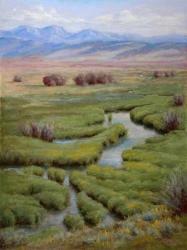 His piece Torrey Creek Meadow must have impressed the juror, Scott Yablonski of Denver, Colorado, beyond the measure of the painting's small 9 x 12 inch size. Scott told Gary at the reception that he liked the composition. He thought the foreground white water was interesting and the overall handling of the stream was especially good. The painting's location near Dubois, site of the show, may account in part for the crowd of people around the painting all evening. Gary met some of the folks that live on the ranches in the Torrey Creek valley and they said they immediately recognized the spot. The painting ended up with a sold sticker on it by the end of the show. A delayed highlight of the show was winning the popular award for the painting Converging Currents. 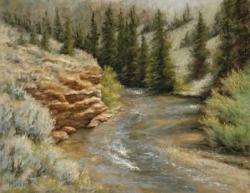 One of the larger paintings in the pastel division, it is another stream subject, this time in the Bighorn Mountains close to Gary's home. The "popular award" is determined by votes of the people who visit the show over about a ten day period so the award winners aren't known until the end of the show. Gary is happy to be recognized for the water paintings since that subject is one of his favorites to paint.